As those portraying Santa Claus, we are able to express so much through our personal choices in that portrayal. Our Santas vary in personality, demeanor, and appearance by quite a bit. Now, these choices happen as a result of many things; our own imaginations, our childhood memories, books, poems, fellow Santas, films, and so much more. Today, I wanted to review where I personally have found much inspiration in my portrayal, and that's ARTWORK. 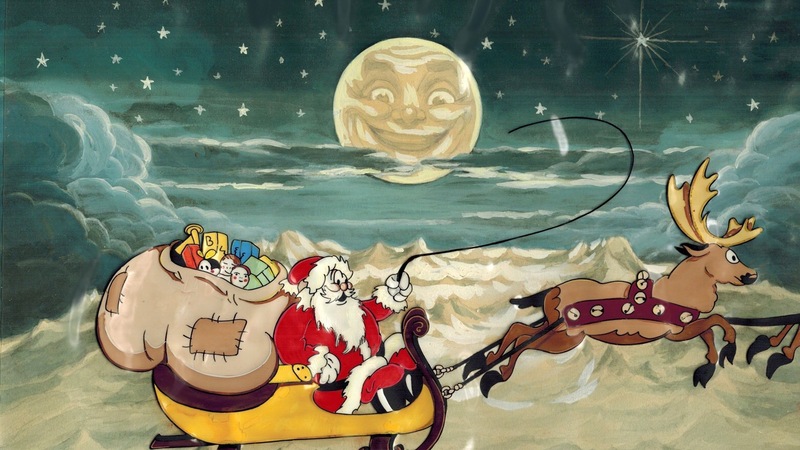 Speaking of the the American Santa Claus, what we might say is the base foundation of Santa Claus has evolved as artists placed their own personal touches and choices within their art. Some artists can be attributed with much of what that "foundation" is...while others have taken that foundation and added upon that. Either way, I wanted to share with you, those artists that have made a difference for me...pretty much all of my favorites; historic and contemporary. His eyes- how they twinkled! his dimples how merry! While we have these iconic words found in Clement C. Moore's famous 1822 poem "A Visit From St. Nicholas," it was artists who shaped from those words and their imaginations, what we know today. While I would love to go into detail on the history of each artist, this is really an opportunity to share my favorites and those that have made a difference for me. While some of you might have stumbled into portraying Santa and just thrown on the suit, some or all of these images might be new to you. My hope is that you can find some inspiration here too in creating YOUR Santa...inside and out. Thomas Nast has been credited with making the first real dent in the image of the American Santa. You can see many changes in the time of his work. From clothing to size...Santa begins to really take shape with many elements of the image of Santa still around today. From the look of his face/beard, his big belt, even the fur rimmed hat...we truly begin to see Santa. Now, I'm a collector at heart and finally finished a full set of original Thomas Nast prints this past year featuring Santa Claus. His work has and will continue living on for the ages. Now, this is quite a big jump in years, as American illustrators after Nast were creating all kinds of artwork that focused on Santa. My next favorite though would have to be J.C. Leyendecker. He was certainly WAY before his time and many actually see his work and first think perhaps it's from Norman Rockwell. He has a sense of warmth that I LOVE in his work and he is one of my very favorites. As with most of my favorites, these images are rich with detail and keep the eye moving. Just look at that little boy...don't you just want to pinch his cheek! We could not go into any kind of look at the history Santa art without featuring the work of Haddon Sundblom. His work on the image of Santa for the Coca-Cola Company is truly iconic. While drawing from past artists, Sundblom added his own touches that can still be seen in how many professionals choose to portray Santa Claus to this day. While many, I believe give too much credit to Haddon and the image of Santa, his work and the driving force of the Coca-Cola Company brought the image to the masses. Next on the list is a family favorite, Norman Rockwell. I grew up with the art of Norman Rockwell, as he was my grandmother's favorite artist. They would actually write back and forth and her home not only had many of his prints but also a few personal sketches of his as well that he sent to her. The next artist worked primarily as a book illustrator and became a favorite of mine on his 1940's-50's work of Santa's surrounding. There is so much detail here, this is something I really look for. Moving into what I would call "contemporary Santa Claus art", we start things off with a brilliant artist, Scott Gustafson. His work is truly beautiful and I find it quite inspiring with his rich but soft details. Moving on to another favorite, this next artist has truly brought not only beautiful imagery to Santa Claus, but also creates rich and magical environments. There is more of a classic feel in style to his work in color and tone...but certainly with a magical touch of contemporary illustration. The next artist is probably the most successful contemporary artist today when it comes to the image of Santa Claus, Tom Browning. I've had the opportunity to visit with Tom on a few occasions and his work is quite fun and can be seen in almost any store you enter during the holidays with his work found in greeting cards, wrapping paper, gift bags, and more. The next artist is Myles Pinkney and he is yet another favorite on my list. His mixed media approach to art creates quite a unique look and his styles is saturated with details. You will also notice, out of all of these artists, Myles' work had the biggest impact on my own suit design. Myles works focuses on many fantasy subjects, like fairies, dragons, steampunk genre, and Santa Claus. His Santa work for me certainly stands out. As a performing and visual artist, I love to step into these paintings and illustrations. There is just SO much there to experience. I also like to look at these paintings and image, how would this particular Santa move, act, speak, what's going on in the background, etc. Not only have I used art as a way of inspiring my portrayal, I've also used art in my portrayal. A concept that I began this past year was to create a unique and special card to say "thank you" to my clients. In this card, I wanted to have an illustration or painting that depicted not any Santa but my personal portrayal as Santa, offering clients a glimpse of their Santa in the middle of doing something they would never actually see me doing. I'm not sure that makes sense but the feedback I got was overwhelming. The cards are handmade by a professional card maker and feature the print of the years painting/illustration, as well as artist information and my own wishes for them. Here is a peak at last years painting that was used. This brings me to my last artist I wanted to feature in this blog posting today. I first stumbled upon his work a few years ago and fell in love with his unique style. A rich a creative look with a slight twist, I love the detail rich images and the hand drawn feel. Robb is another artist I've been able to visit and he has been commissioned to create the 2014 season's image and I am excited at what we will come up with this year. My fellow Clausnet friends, I hope, regardless of where you find it, that you find inspiration in how to portray Santa. It certainly is not a cookie-cutter goal but finding how to put your own special touches and feelings into your portrayal. Fine tuning your inner character, and then moving to your outward appearance is exciting. I wish you all the best in how you choose to portray Santa Claus and that we all continue to grow, learn, and improve. I pray that the families and children we come into contact with will feel that they have spent a bit of time with THE Santa Claus. Next entry I Spoke With THE Perfect Santa!..WHAT! ?